Even though soundness and centering are the primary components of a stamp's grade, there are several other factors that must be considered such as the cancellation, color, impression and overall "freshness" of the stamp. These factors have a definite effect on the market value and hence, the grade of a stamp. 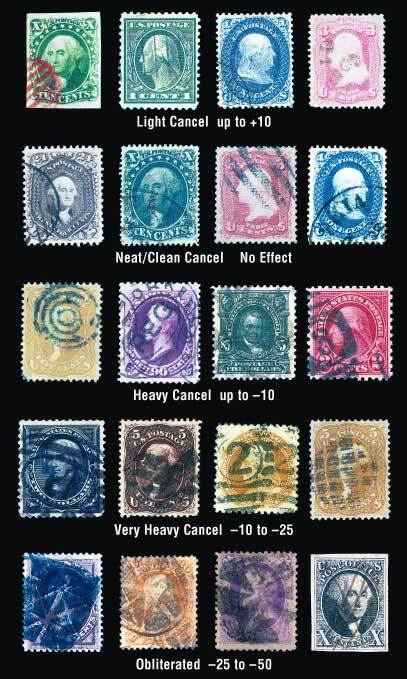 The eye appeal of a used stamp deals primarily with the cancellation. While some collectors specialize in odd, unusual or fancy cancellations, the majority of collectors prefer a lightly canceled stamp with as much of the original design showing as possible. A heavy, dark cancellation that obliterates the design of the stamp is certainly less desirable than a light cancel that affects only a small portion of the stamp. The final grade of a used stamp may be increased up to 10 points for an extremely light, or pleasing cancellation and a fresh overall look. Used stamps with a heavy, unattractive cancellation, a pen cancel or a "tired" look may be reduced in grade up to 50 points. The eye appeal of an unused stamp deals with its color, freshness and impression. The final grade may be adjusted up to 10 points (either up or down) based on the visual impact these factors have on the stamp. Particularly impressive color, freshness or impression can add up to 10 points to the grade, while unusually dull or poorly impressed stamps can lose up to the same amount. The following table summarizes these eye appeal adjustments for used stamps only. Heavy Heavy cancel. Slightly "tired" appearance up to -10 pts. Unused Stamps may be adjusted +/- 10 pts based on color, freshness, and/or impression. After the adjustment for eye appeal, the stamp has its final grade.